Categories: Slim (6 mm), Isolators, No. 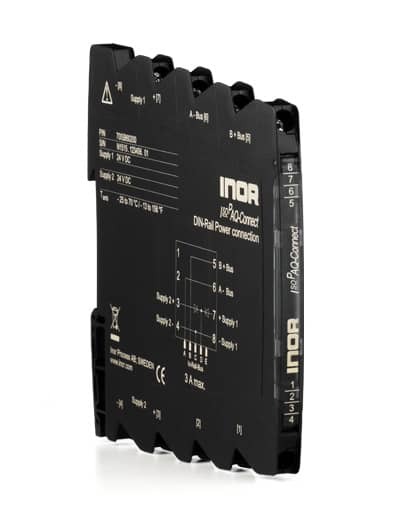 The 6.2 mm wide IsoPAQ-Connect power terminal is used for supplying the In-Rail-Bus DIN rail connector with supply voltage. Two separate and reverse polarity protected voltage inputs allow a redundant voltage supply of 24 V DC and a maximum current of 3 A (recommended fuse: 3,5 A, Slowblow). The status of the power supply of both voltage inputs will be displayed each by a LED on front. A green LED lights up when there is supply voltage on the voltage input. A red LED indicates reversed polarity.